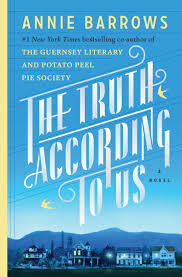 a book chick: "The Truth According to Us"
"The Truth According to Us"
my take: What is history, if not the truth according to us? Set in the American depression, the tale of a city girl doing WPA work in small town and the family she boards with. Secrets abound in the small town, as well as lots of folk lore about their history. I loved this behind-the-scenes kind of look at how history is recorded - reminding me that who tells and who records it are what mostly make "history." Yes! I just read a children's book titled, "Ear Muffs" about Chester Greenwood being the inventor of ear muffs. More truthfully, he was the improver of ear muffs who is credited as the inventor bc someone looked back in history and assigned him that ownership bc of time and place and an interesting back story.